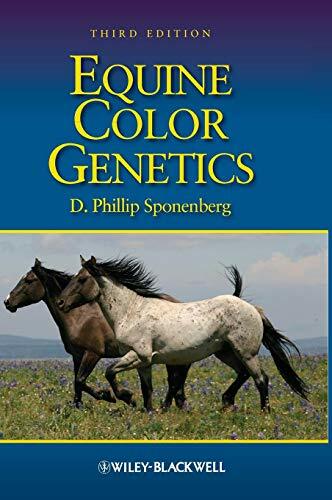 Equine Color Genetics, Third Edition, presents the most recent advances in color genetics for breeders of horses, donkeys, and mules. The book provides valuable information that enables breeders to tailor their breeding programs to maximize desired color outcomes and minimize undesired color. The text bridges the gap between the scientific and lay communities without ignoring the intricate and complex issues involved in horse and donkey color genetics. This new edition presents more explicit and detailed explanations than were previously possible, including a more extensive Appaloosa section. The section on donkey colors includes the results of studies in the genetic control of color in this species, which will greatly assist donkey breeders as they tailor breeding programs to their own goals. Le informazioni nella sezione "Riassunto" possono far riferimento a edizioni diverse di questo titolo. D. Phillip Sponenberg, DVM, PhD, is professor of pathology and genetics at the Virginia-Maryland Regional College of Veterinary Medicine, Virginia Tech, Blacksburg, and has worked in the field of animal color genetics for nearly three decades. His work with rare breed conservation, largely through the American Livestock Breeds Conservancy, has provided ample opportunity to pursue the variations and details of color in several uncommon but important breeds. Le informazioni nella sezione "Su questo libro" possono far riferimento a edizioni diverse di questo titolo. Da: Regno Unito a: U.S.A.